PayPal, Skrill, Ukash, VISA, Maestro, Giropay, Sofort, Neteller, iDeal, Instadebit, Paysafecard etc. 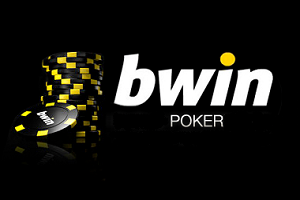 The bWin Poker allows you to enjoy some great mobile gambles. The app lets you enjoy real money gambles as well as free money games, for as long as you want to. 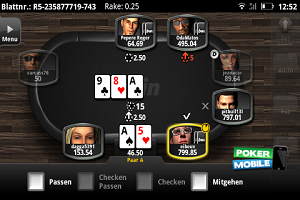 There are various variants of casino poker for you to enjoy with the app. You can also enjoy some of the best bonuses along with the thrilling gambles. The app has a minimum requirement of iOS 6.0 or above to run seamlessly on your Apple devices. You can run on either iPhone, iPad or iPod touch devices. You can also connect the apps to a single account, if you own multiple compatible devices. Also iPhone 5 owners can enjoy exclusive optimized mobile gambling. The app currently supports more than 8 major languages, which you can set according you your preference. You can also enjoy playing on multiple tables. The easy app switch functionality lets you switch and take calls easily. The app also lets you enjoy some of the richest casino gambling bonuses. The bonuses of the casino considerably boost your wagering capability, getting you more than what you put in. The welcoming bonus of the casino app lets you scoop up to £25 or more! The app lets you tweak all the setting regarding your account with relative ease. Just a few taps and we landed on the setting page. If you happen to face any issue with their app, help is just a touch away. You can get in touch with them 24/7. 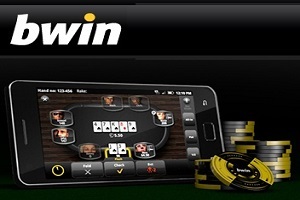 Overall the bWin Poker app lets you enjoy a splendid mobile gambling experience!